Walter “Ed” Vizthum’s large heart gave out on him at 32-years-old on Aug. 28, 2017. He left behind two newborn twin girls and a deep hole in the hearts of his many friends and family members. To honor his legacy, his friends and family have created the Walter “Ed” Vizthum Scholarship Fund with a mission to benefit incoming freshmen students with a scholarship at Holy Spirit High School, his alma mater. 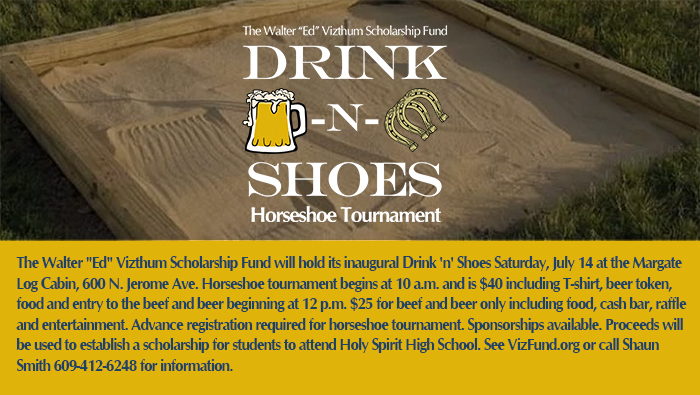 We invite you to join us for our inaugural Drink ‘n’ Shoes Horseshoe Tournament Saturday, July 14 followed by a beef and beer at The Margate Log Cabin, 600 Jerome Ave., Margate, NJ 08402.